THE return of the V8 Supercars Championship to Pukekohe Park Raceway in New Zealand this weekend for the ITM 400 Auckland is one that has been greatly anticipated since it was first announced. With the all-new 2013 specification ‘Car of the Future’ - including new Nissan Altima and Mercedes-Benz AMG E63 machines - and a modified and updated venue, there’s much to look forward to this weekend. But in true Sleuthing style, we thought it a good time to look back at the previous Pukekohe events from 2001 to 2007 – and we asked ourselves a question. What happened to all of the cars that conquered those Pukekohe events? Our V8 Sleuth Aaron Noonan has been trawling his database and come up with the answers. And when you sit down and analyse the cars that have great history at Pukekohe in the V8 Supercar era, it quickly becomes clear that all of them were from the TWR/HRT/Walkinshaw Racing stable. Many will remember the absolutely dominant form of Kiwi hero Greg Murphy in the early years at Pukekohe. Murph claimed three straight round wins between 2001 and 2003 for Kmart Racing and, while they all carried the #51, each time he drove a different car! In 2001 for the inaugural championship event, Murphy piloted HRT 041 to victory, taking pole position and claiming all three race wins. The Holden Racing Team had previously used this car in factory red before being given to the ‘sister’ Kmart team – after Murphy’s form in Pukekohe that year you’d excuse them for perhaps asking for it back! That car would morph through its later years as a Young Lions car for Rick Kelly, and a Team Brock/PWR/Supercheap Auto car for Paul Weel before being sold to Kiwi Mark Porter to race in the 2006 Fujitsu Series. Sadly, it’s the car the he was driving when he lost his life in an accident at Bathurst. For the 2002 Pukekohe event, Murphy moved into a newer car – HRT 046 – which is the same car we featured in Saturday Sleuthing a fortnight ago that Murphy took to victory in New Zealand in 2005 in Super Cheap Auto colours. Murphy claimed the 2002 round in New Zealand, though only won one of the three races. However, it was enough for him to lead home Todd Kelly in a Kmart 1-2 finish for the round. When the championship returned again in 2003, Murphy was again in a different chassis – but one that had just given him the greatest two days of his racing life a few weeks before. Aboard HRT 043 – the car he had set his ‘Lap of the Gods’ 2m06.8594s pole time at Bathurst and then won the race the next day with alongside Rick Kelly – he claimed his third straight Pukekohe round victory, this time with two race wins out of three. That car would continue with Kmart Racing before becoming a spare chassis and then sold off and raced in the V8 Supercar Development Series before being purchased by collector John Anderson and restored by George Smith and Rick Wyatt. It was on display at last year’s 50th Year of Bathurst celebration race with Murphy himself stepping back behind the wheel and turning some laps. The Pukekohe event was moved from late in the season to early in the calendar for 2004 and was run in May – perhaps that threw Murphy off, given it also saw a new round winner at the circuit in Jason Bright! Bright drove for Kees Weel’s PWR Racing squad, though his round winning mount (which claimed two race wins from three that weekend), had plenty of history at HRT. The chassis – HRT 042 – is one we featured on Saturday Sleuthing last year and is undergoing restoration and refurbishment in Melbourne, though was the car Mark Skaife used for the majority of his 2000 championship-winning season. While it claimed victory in Pukekohe with Bright in 2004 – and thus stopped Murphy from winning his fourth straight round – it ended up in a mess later that year on the Gold Coast when Bright was punted into a concrete wall by Rick Kelly. It was repaired and stayed in the PWR team and returned to the track in 2006 in the hands of Greg Murphy and Cameron McConville, though its luck didn’t improve and it was involved in some further accidents. It went through the hands of a few private owners before ending up with John Anderson – the same man who owns HRT 043. Murphy bounced back in 2005 to claim victory at his home event and did it in the same HRT 046 chassis he’d used to win the round in 2002. By then it had been upgraded to VZ specification and was now in Super Cheap Auto colours run by PWR Racing after Murphy replaced the FPR-bound Bright for the ’05 season. The Kiwi ace claimed all three race wins in this car, which has now been restored to its 2005 livery and featured in our Saturday Sleuthing column a fortnight ago. If you missed the story, click here (http://www.supercars.com/news/the-pukekohe-king-s-car) to check it out. In 2006 it was Mark Skaife’s turn to clinch overall round victory for the Holden Racing Team, which he did with two race wins aboard chassis HRT 053. This was a special win too as it drew Skaife level with Peter Brock for most round wins in the history of the Australian Touring Car Championship/V8 Supercars Championship. This car only spent one season in HRT colours before competing in the Development Series in 2007 and 2008 with West Aussie Mark McNally and eventually being purchased by Ute racer Warren Millett, who – once recovered from a broken foot – will race it in the V8 Touring Car class for ex-V8 Supercars on the Shannons Nationals racing tour. 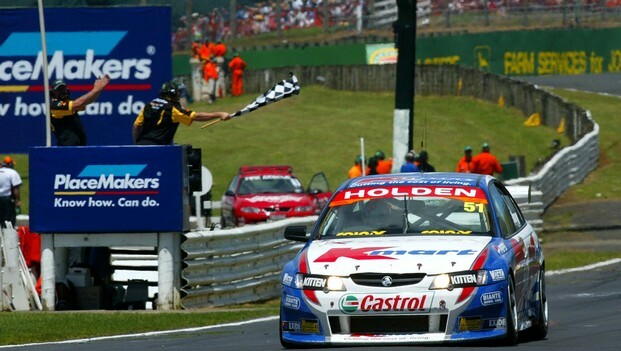 The last Pukekohe event in 2007 saw victory for Rick Kelly in his Toll HSV Dealer Team Commodore VE – which was WR 002. Kelly claimed the final of three races to head teammate Garth Tander for the round. He’d drive his Pukekohe-winning Commodore for the remainder of the season and again drive it in 2008 before Ben Eggleston purchased it to race in the Development Series from 2009 onwards. In fact, it made an appearance in the opening round of the Dunlop Series this year in Adelaide in the hands of local Jay Verdnik, through still run by Eggleston’s team. So who will have the car to add to the winner’s list at this weekend’s ITM 400 Auckland at Pukekohe?